This is common while working with Dynamics 365 Portals we need to setup page redirection. 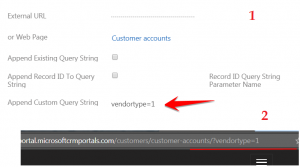 Sometimes we want to use existing query string parameter sometime we need to use a different parameter. Today I am going to discuss different options which can be used to set page redirection in entity form through configurations. 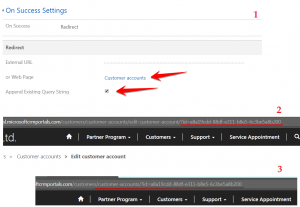 Page redirection can be configured from the portal entity form record, Redirect section is visible once Redirect option is selected under On Success option. We can use following options to setup page redirection. We can redirect our page to some external URL after successful submission, for example if I will write http://himbap.com/blog it will redirect to my blog after submission. We can use this option to select any existing portal web page, for example may be we want to redirect to entity list web page or home after record created or updated. This option can be used to append existing complete QueryString to the page where user will be redirected after save, so for example let’s say currently we selected this option under 1 and selected customer accounts where we want to redirect user after save. While we are on the customer edit page we can see the querystring and now after save we are redirected to customer accounts and we can see we got the same querystring. 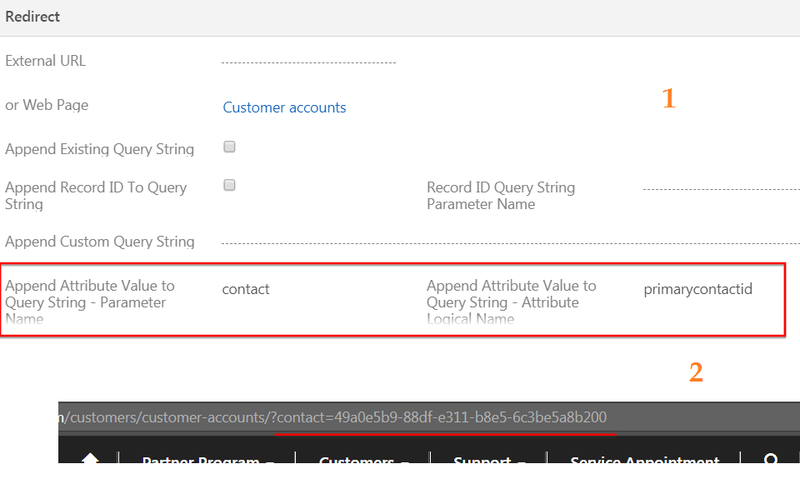 This option can be used to append current record id to query string, so for example we have opened account so it will add the account id in the query string, but it won’t add any parameter name to query string, to add parameter we need provide under Query String parameter name. 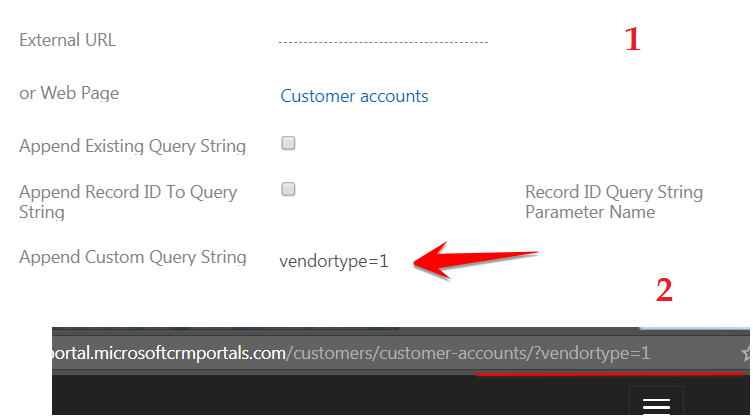 In following screen we have configured to include id in query string and we have added parameter name as vendor, so after redirection it will look like below. This option can be used to append a custom query string based on the requirement, for example let’s say we want to pass vendortype parameter, so we can configure it like following. 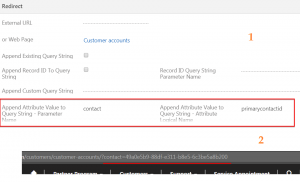 This option can be used to append custom query string parameter name and value of a form field by providing field logical name, for example in following screenshot we have configured parameter name as contact and use priarmycontactid (logical name of the primary contact) from account form. After redirect it will append query string like in screen 2.